to serve as the "Warrior Proxy" for the "Air Warrior" bronze sculpture. 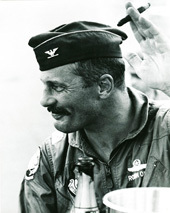 Robin Olds represents our warrior heritage. His credentials, close association, and degree of separation to our graduate community will do much toward satisfying disagreement which will inevitably occur if we select a contemporary graduate. Olds credibility as an Air Warrior is unassailable: 17 victories, airplane in the AF Museum, President called him to the White House for a personal briefing, unparalleled success as a Wing Commander, loyalty and respect of his men..
As a WW2 and Vietnam warrior he has a unique history which spans the years and gives him unprecedented credentials. For the early classes he represents our fathers and is our connection with history. His father, Maj Gen Robert Olds, was an early aviator who helped develop military air power. 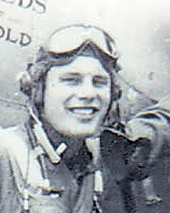 Robert Olds developed daylight precision bombing and the B-17 which was largely responsible for the winning of WW2. 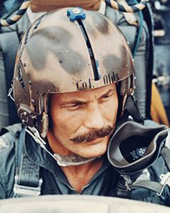 As a child, Robin Olds grew up listening to the stories of his father's friends; men like Eddie Rickenbacker, Hap Arnold, Carl Spatz, Billy Mitchell, Roscoe Turner, and many others. These men molded his dedication to the Air Force and the warrior ethos. 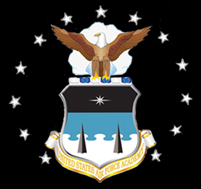 His life represents a unique continuity and bridge between the earliest beginnings and present day Air Force. As a former Commandant of the Academy, he has a close association with the school and seven classes. His four year tenure at the Academy as Commandant coincided with the class of 1971 maturation; Robin Olds was our commandant. He is a graduate of our sister Academy, West Point 1943, If the AF Academy or the Air Force had existed in 1941 he would have surely earned an appointment here. He is buried in the Academy cemetery. His arrival at the Zoo came at a time of terrible civil unrest. Flower power hippies and anti war activists were vilifying the US military and us too. He became our father figure and gave us a needed morale boost at the right time and made us feel important, necessary, and patriotic. He fiercely believed in the honor code and fought to end honor code abuse so we would willingly embrace the code as a part of our lives. 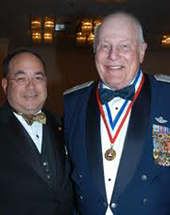 He is the only person for both the College Football and Aviation Hall of Fame. From an artistic point of view he is the perfect model for a Proxy: powerful, athletic, fierce, and imposing. A casting director's dream. His physical features and body language exemplify air power and a true warrior. 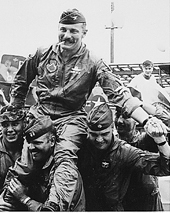 Robin Olds' life embodied the AF Core Values: Integrity First , Service Before Self, Excellence In All We Do. Team player who always gave credit to others. Loved his job and loved his men. Led by example: flew every mission. Stopped logging at 99 so he would not be sent home. Generous heart.... and treated all with respect and kindness. Great sense of humor and knew how to use it to motivate his men. 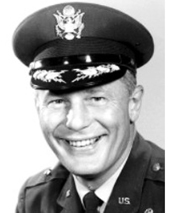 The selection of Robin Olds as a sculptural symbolic Proxy will significantly contribute to the credibility of the Air Warrior Combat Memorial, firmly establish the warrior context, and will more effectively allow the memorial to honor all warrior graduates of the USAF Academy . On his broad shoulders we all proudly stand. Once in a great while, we encounter a larger than life individual who instantly captures our imagination and respect and inspires us in a larger than life way. 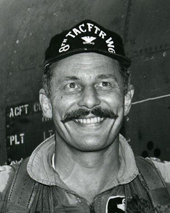 I would propose that Robin Olds was just such a man. All one needed to do was meet him once and you were instantly impressed that you were in the presence of an uncommon individual; He was a huge, boisterous, flamboyant, swashbuckling, old time warrior who cut through life with a wide wake and in the process left us stronger as a nation, service, and as individuals. 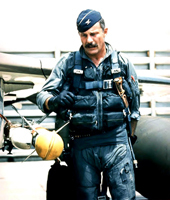 Robin Olds was of course a great pilot and warrior, but the Air Force and the Air Force Academy has produced many great pilots and warriors; so what sets him apart? 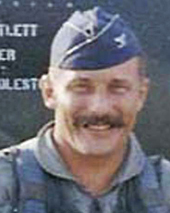 His uniqueness covers many areas which taken in totality create a patriot who was dedicated to the Air Force and his country and led a life which embodied the Air Force core values, the honor code, and the warrior ethos. There is no better choice than Robin Olds to honor as a sculpture proxy for the Air Warrior Combat Memorial. At the most basic level, Robin Olds was our connection with aviation history. His father Major General Robert Olds who was born in 1896 was an early aviation pioneer, aide to Billy Mitchell, and airpower advocate. 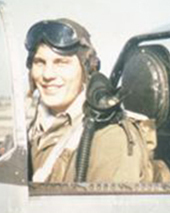 As a small child Robin grew up in a military aviation family and cut his teeth listening to the stories and visions from his fathers friends such aviation greats as Hap Arnold, Billy Mitchell, Carl Spatz, Eddie Rickenbacker, Fiorella La Guardia, Roscoe Turner, and others. These dedicated individuals were struggling daily with the almost insurmountable task of convincing a calcified 19th century holdover General officer corps, who begin careers on horseback, that military aviation was a viable weapon. 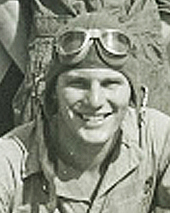 His father participated in the defense at the insubordination court martial of Billy Mitchell and later led the way in the development of precision daylight bombing and the B-17. This early childhood influence surely contributed to a deep conviction that the welfare of the service and nation took precedence over dangerous misguided policies set by some individual officers. Long before someone wrote a code and entitled it the Air Force “Core Values,” Robin olds lived them in his daily life. His father instilled in Robin the values of Integrity first, duty before self, and excellence in all he did; values which guided his service through out his life. Standing on his father’s shoulders, Robin Olds path through life covered the entirety of military aviation; His life defined aviation and it was a privilege to know him. 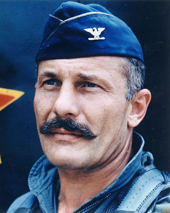 He is our connection to the past; Robin Olds is our heritage. All modern air warriors, regardless of aircraft, mission, or conflict stand on his broad shoulders. 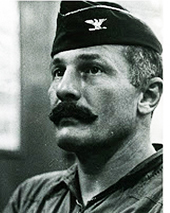 As a West Point ’43 Grad Robin Olds also excelled in athletics and is the only person who is listed in both the aviation hall of fame and the college football hall of fame. He showed us through example of the important connection between athletics and academics, mind and body, discipline and teamwork. Attributes, which made him excel in everything he did. Occasionally someone who did not know him will refer to Robin Olds as a “Maverick.” Nothing could be further from the truth. The dictionary defines Maverick as: “One that refuses to abide by the dictates of or resists adherence to a group. 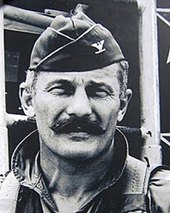 One that operates independently, a Loner.” On the contrary, Robin Olds was a true team player who was always willing to give others credit, when a lesser commander might claim credit for himself. From lessons learned on the football field at West Point to the skies over Vietnam, Olds was a true believer in teamwork and preached the same to his men every day. In addition to building a team with in the 8TFW Olds spent considerable energy building bridges between rival units so that they could work more effectively together as a team. In his book, you can read for yourself the praise he gave other air warriors whether they were B-17 crews or C-135 tanker crews, all working as a team to the same end. In Thailand his mechanics would voluntarily work days without sleep because they knew Olds respected their membership in the team and they were needed and appreciated. 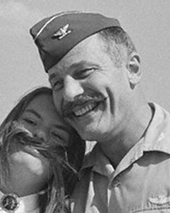 Robin Olds a Maverick? Not on your life! 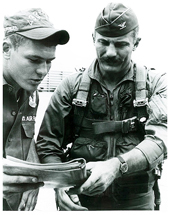 Robin Olds excelled as a combat leader of men like no other. In the opinion of many, Robin Olds was one of the greatest aviation combat leader our country has ever produced. This distinction in itself is worthy of recognition. Peace may be won by the masters of diplomacy and strategy, battles are won in the trenches by gutsy men like Robin Olds and the brave men he led and inspired. 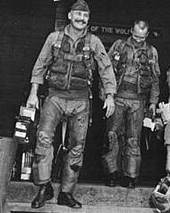 Robin Olds was a dedicated and mission oriented individual, a team player who fiercely protected his men. As a triple ace from WW2 and Vietnam, he possessed a unique insight into tactics and leadership. His pilots would and did fly through hell and sometimes died for him. In an uncommon manner, he never ever asked anything of his men that he would not do himself. While the previous wing commander of the 8th TFW flew 18 missions in a year, Olds flew them all and stopped logging at 99 so he would not be sent home. He insisted on leading the most dangerous missions and when AF ordered him to stop leading missions, he flew wing. After downing 4 migs he would always pass the kills to his wing man so again he would not be sent home as an ace. A lesser man with an self serving ego would have been tempted to bag his 5th kill, go home early, and become the only person to be an ace in WW2 and Vietnam. Olds dedication and integrity would not even consider it, because it would mean leaving his assignment early and who would take care of his men? His tactical brilliance led to operation Bolo where his men shot down half the North Vietnamese Air Force’s Mig-21 fleet in single mission. With his experience and tireless dedication he influenced the air war in Vietnam like no other single individual. His persistence and arm twisting, and telling the unvarnished and often unappreciated truth to superiors saved countless lives while drastically improving tactical results. He expected and demanded the same truthfulness from his men and encouraged constructive criticism of his own performance when ever possible. His personal character was exemplary in the areas that really count. He was a legendary practical joker with a great sense of humor and knew how to use it to bolster morale. Olds life was the embodiment of the honor code. He was not a yes man and was truthful to superiors and men, never hesitating to suggest and campaign for safer and better tactics. One inevitable by product of this intensity was that superior and contemporary egos were sometimes bruised; in his fierce determination to win a war which our political leaders had no will to win, he occasionally earned the animosity of those who found it easier to shoot the messenger than address the problems. Yet ironically, on the day of his return home President Johnston called Colonel Olds to the Oval office to ask for an honest assessment on how the war was going. This unprecedented invitation alone is proof of his earned credibility. 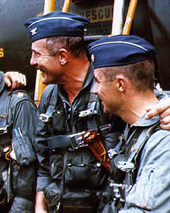 The term is defined in the dictionary as: “A prolonged public dispute, debate, or contention concerning a matter of opinion representing opposing sides in an argument.” Yes, Robin Olds was controversial in his career, few of his friends would disagree; and it was this personal courage and willingness to embrace controversy which set Robin Olds above others. Human nature has a tendency to institutionalize thinking. As soon as some idea become established, it becomes the Status Quo and institutionalized to the point that anyone offering a different viewpoint is considered a heretic and persecuted. Unfortunately this leads to stagnation in all matters of life from art to warfare. As a society we need those individuals whose dedication and courage compels them to speak out and challenge the status quo whenever it becomes outdated and dangerous. In fact almost every advance human history in every field of endeavor has been brought about by a “controversial” individual whose integrity compelled them to speak out. 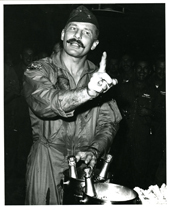 Robin Olds integrity compelled him to speak out in Vietnam and contribute a positive change in air power policy. 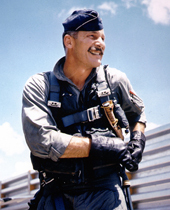 If you ask most any Vietnam era pilot, who best represented the air war, most will answer Robin Olds. 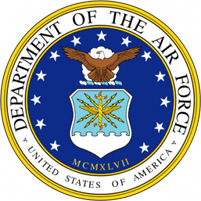 Many grads and AF pilots also exhibited superior airmanship and courage during the war. 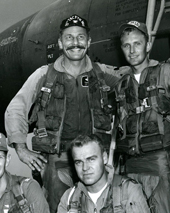 Why is Robin Olds so important to this group of aging warriors? 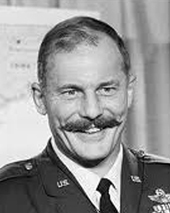 Why do so many hold Robin Olds up in such high regard? 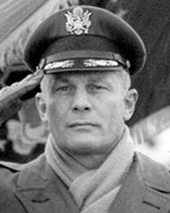 The answer is; Olds by his untiring dedication to the USAF, personal leadership, and ferocious protection of his men became a willing lightening rod of controversy, which mirrored the controversy and contradictions of the war itself. As a front line wing commander, when Olds spoke he gave us all voice. Before his Vietnam tour, superior officers saw themselves as managers. Olds redefined the philosophy of “Follow me” and the Air Force relearned that an efficient commander lead by example. So many of our grads and Vietnam veterans have unresolved conflict in their hearts from the war. They were often vilified by the public and sacrificed by politicians who had no will to win. Yet in the face of this overwhelming challenge our grads all served with honor, pride, and uncommon courage, and tried desperately to watch out for each other. When Olds legacy is minimized and his accomplishments ignored by certain politically correct individuals, thousands of veteran warriors take it very personally; they see this unjustified character assassination as a repeat of the vilification they all experienced and a cynical disrespect to the heroic accomplishments and sacrifices they all made in the selfless service to our country. Over the years, without asking for the honor, Robin Olds has become their proxy. So it is altogether fitting that Robin Olds finally be honored in bronze as the warrior proxy for the Air Warrior Combat Memorial. It is important to remember that this is not just a monument to Robin Olds but rather a memorial to all Air Warriors. Olds selection serves to symbolically and artistically reinforce the theme and message of “Fly, Fight, and Win” nothing more nothing less. I think that Robin Olds would have liked that concept. A monument to "honor" instead of himself. 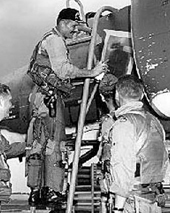 If we now give Robin Olds the honor he richly deserves we will also perform a much greater service; we will also be honoring every grad and every Air Force pilot who flew in Vietnam as well as every conflict. We will validate in our time, by his example, those values associated with every effective combat leader throughout history. Our recognition of him will be shared with pride by thousands and we will help offer some closure on the controversy that was Vietnam. This credit is long overdue. Finally Robin Olds was our Commandant. He belonged to the USAFA class of 1971. He arrived in our Doolie year and left when we graduated as an honorary member of our class. His arrival invigorated the cadet wing at a time when the flower power hippies and sheltered war protesters were vilifying every member of the military including us. He was a heroic figure at the right place at the right time and he gave us a manly role model to reignite our self esteem. Gen Moreman understood this and specifically requested Olds just to improve cadet moral. He was as loyal to us as he was to his combat pilots. When he arrived the honor code was suffering because it was being abused to make us incriminate ourselves. “Cadet have you violated any regs today?” Was a common question. Olds believed the honor code should be willingly embraced as a code by which we would lead our lives…. not a disciplinary weapon which would be resented and feared. Olds lived by the honor code his whole life. We do not need to be fighter pilots or pilots to appreciate the lessons he preached. He challenged us to excel in everything we do, put integrity first, place duty to our country before ourselves, be truthful, take care of each other, and never be a slacker or a yes man. Whatever path we have taken in life, Military, Bankers, Doctors, Lawyers, or Airline pilots, everything, these down-to-earth values have paved our way and have made us better individuals. 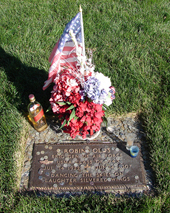 Appropriately enough Robin Olds is buried at the Academy cemetery, where he continues to watch over us. In conclusion, Robin Olds was a warrior, leader, and patriot who led a life which embodied our most sacred military values. There is no better person to serve as a warrior proxy in the Air Warrior Combat Memorial and no better leadership and warrior role model for our young cadets than Robin Olds.